This blog entry was posted by Jim Brown, pastor of the Grace Brethren church in Goshen, Indiana. To read more, click here. As I type, one of our own here at Grace, is in Haiti. She flew in a few days ago with a medical team and is holing up in a makeshift tent, and helping people. Sonia Green lives on the front lines the majority of her life. She has been on numerous mission trips that Grace Community has sent out, and she heads up our short-term mission teams along with her Husband Kim. Grace Community is full of people like this and the world is a better place because of them. This baby was born during the earthquake that rocked Port au Prince. In the midst of so much death, God brought life. Please pray for this baby as they are not sure the baby will make it. 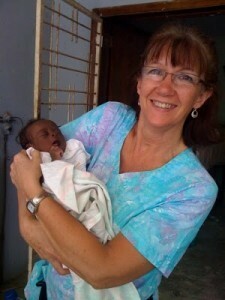 Please pray for Sonia too as she uses her medical skills to help the survivors. Continue to pray as we seek to put more feet on the ground with other teams.